This entry was posted in Downtown, Organizations and tagged Dorian Barth, Great Duck Race, Westport Rotary Club. Bookmark the permalink. 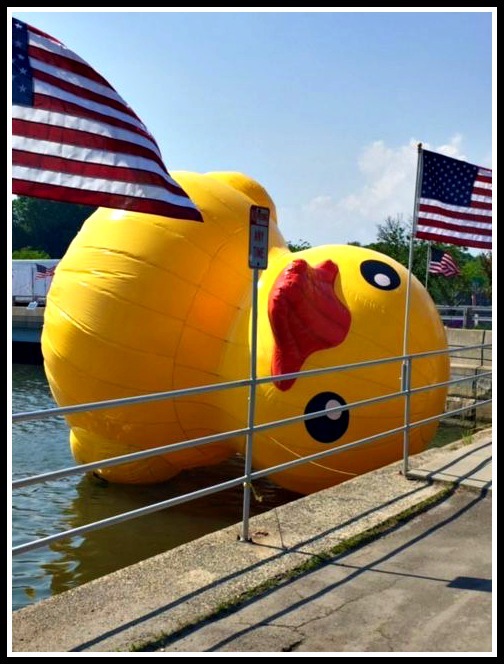 The duck needs ballast below the waterline. One suggestion is to use the eyelets on the bottom make a simple rope bridle at the 12/3/6/9 o’clock position and hang some weight from that center point. A concrete block would be enough. hear us tell him how handsome he is….and we have great pride in his being in Westport. Ahoy! Nine little rubber ducks are still afloat! He’s resting in a “No Parking Any Time” area. But it is a napping zone. Sunny is upright again. Thanks to Morley Boyd, Jaime Bairaktaris and Orlando Fonseca, who braved the muck of the river to lift her up. Once again, Sunny is a Sitting Duck!